Finding that "something" has been a goal of researchers for decades. In the 1970s and 80s, observations by two German/US Helios spacecraft set the stage for early theories, which usually included some mixture of plasma instabilities, magnetohydrodynamic waves, and turbulent heating. Narrowing down the possibilities was a challenge. The answer, it turns out, has been hiding in a dataset from one of NASA's oldest active spacecraft, a solar probe named Wind. Launched in 1994, Wind is so old that it uses magnetic tapes similar to old-fashioned 8-track tapes to record and play back its data. Equipped with heavy shielding and double-redundant systems to safeguard against failure, the spacecraft was built to last; at least one researcher at NASA calls it the "Battlestar Gallactica" of the heliophysics fleet. Wind has survived almost two complete solar cycles and innumerable solar flares. "I think we found it," he says. "The source of the heating in the solar wind is ion cyclotron waves." Ion cyclotron waves are made of protons that circle in wavelike-rhythms around the sun's magnetic field. According to a theory developed by Phil Isenberg (University of New Hampshire) and expanded by Vitaly Galinsky and Valentin Shevchenko (UC San Diego), ion cyclotron waves emanate from the sun; coursing through the solar wind, they heat the gas to millions of degrees and accelerate its flow to millions of miles per hour. Kasper's findings confirm that ion cyclotron waves are indeed active, at least in the vicinity of Earth where the Wind probe operates. Ion cyclotron waves can do much more than heat and accelerate the solar wind, notes Kasper. "They also account for some of the wind's very strange properties." The solar wind is not like wind on Earth. Here on Earth, atmospheric winds carry nitrogen, oxygen, water vapor along together; all species move with the same speed and they have the same temperature. The solar wind, however, is much stranger. Chemical elements of the solar wind such as hydrogen, helium, and heavier ions, blow at different speeds; they have different temperatures; and, strangest of all, the temperatures change with direction. "We have long wondered why heavier elements in the solar wind move faster and have higher temperatures than the lighter elements," says Kasper. "This is completely counterintuitive." The ion cyclotron theory explains it: Heavy ions resonate well with ion cyclotron waves. Compared to their lighter counterparts, they gain more energy and heat as they surf. 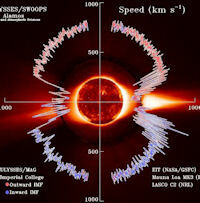 The behavior of heavy ions in the solar wind is what intrigues fusion researchers. Kasper explains: "When you look at fusion reactors on Earth, one of the big challenges is contamination. Heavy ions that sputter off the metal walls of the fusion chamber get into the plasma where the fusion takes place. Heavy ions radiate heat. This can cool the plasma so much that it shuts down the fusion reaction." Ion cyclotron waves of the type Kasper has found in the solar wind might provide a way to reverse this process. Theoretically, they could be used to heat and/or remove the heavy ions, restoring thermal balance to the fusing plasma. 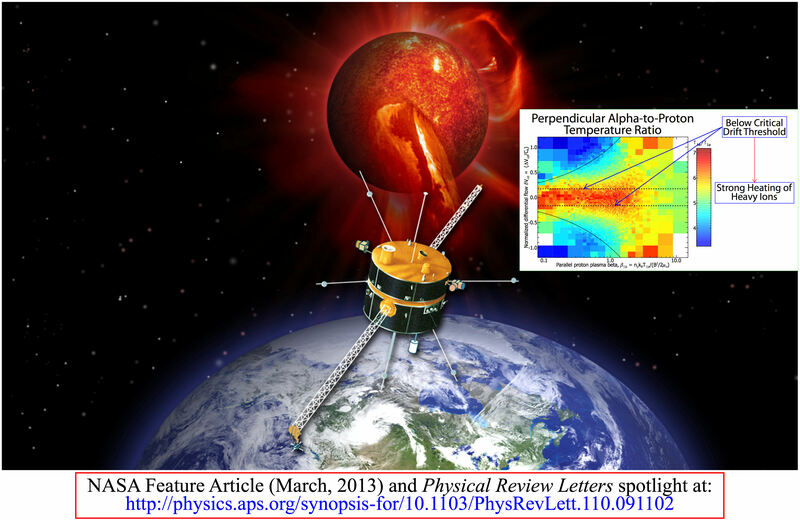 "I have been invited to several fusion conferences to talk about our work with the solar wind," he says. The next step, agree Kasper and Szabo, is to find out if ion cyclotron waves work the same way deep inside the sun's atmosphere where the solar wind begins its journey. 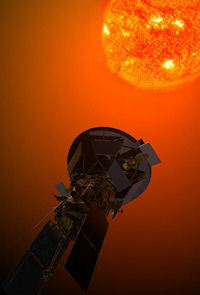 To find out, NASA is planning to send a spacecraft into the sun itself. Solar Probe Plus, scheduled for launch in 2018, will plunge so far into the sun's atmosphere that the sun will appear as much as 23 times wider than it does in the skies of Earth. At closest approach, about 7 million km from the sun's surface, Solar Probe Plus must withstand temperatures greater than 1400 deg. C and survive blasts of radiation at levels not experienced by any previous spacecraft. 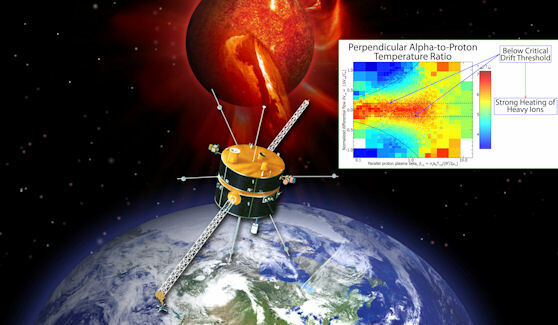 The mission's goal is to sample the sun's plasma and magnetic field at the very source of the solar wind. "With Solar Probe Plus we'll be able to conduct specific tests of the ion cyclotron theory using sensors far more advanced than the ones on the Wind spacecraft," says Kasper. "This should give us a much deeper understanding of the solar wind's energy source." The research described in this story was published in the Physical Review Letters on February 28, 2013: "Sensitive Test for Ion-Cyclotron Resonant Heating in the Solar Wind" by Justin Kasper et al.